Why not create that night time impression to remember! In partnership with Qwrist, our GLOW IN THE DARK WRISTBANDS or Fluorescent Silicone Wristbands will really get the party started. 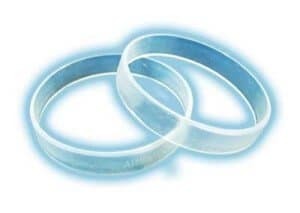 The set up and production process is more involved, so greater minimum quantities do apply compared to regular printed or recessed wristbands. 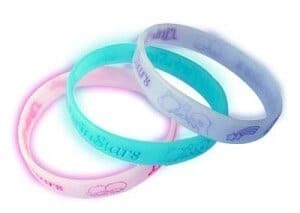 Our available glow in dark band colours are: Purple, Red, Yellow, Blue & Green. Please note, glow in the dark ink for your logo or lettering is not available. Only glow in the dark is available for the actual bands.